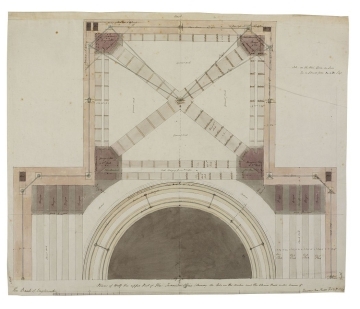 The drawings show the vaulting of the hall at different levels built of stone and brick, with iron tie-rods and chain bars inset into the upper impost level and around the pendentive dome's oculus, providing additional strength. 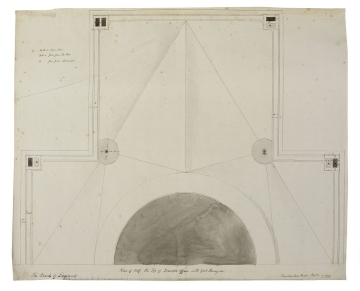 C. R. Cockerell (1788-1863) (Soane's successor at the Bank) describes the novel and curious device that Soane employed to give further support to the groined vaulting in the end-bays, which is demonstrated in drawings 20. 'An iron strap was passed behind and along the diagonal ridge, separating the spandrils or segments of the groin, and attached to the central end of the ridge and carried down under the stones of the impost pier, in order that their weight might tie that end of the iron securely, and resist any shrinking of the groin' (D. Abramson, 'C. R. Cockerell's 'Architectural progress of the Bank of England', Journal of the Society of Architectural Historians of Great Britain, 37, 1994, p. 125). Drawings 18-22 are part of a comprehensive collection of mainly working drawings, many of which have been pricked for transfer. They are, with others, pasted onto the leaves of volume 74 which contains 144 drawings and is inscribed on the spine; Bank Stock Office etc Part III. 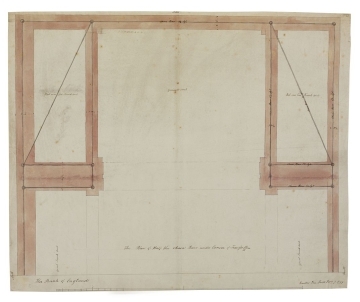 The drawings are arranged thematically and within the volume, eleven of them (affixed to pp. 52-56, 58-63) are dated 7 February 1799. The suggestion is that volume 74 consists of a set of copies kept in the drawing office at the Bank for reference by the Clerk of Works, a position held by Walter Payne from 1789 until his resignation in 1833. 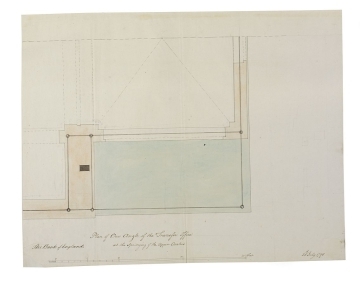 There had been a drawing office on site since 1789. 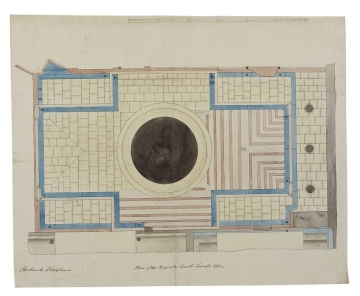 There is another plan of the roof in the collection which was used as an illustration in Soane's twelfth Royal Academy lecture from the second series about construction on 12 March 1815 (SM 11/6/2). 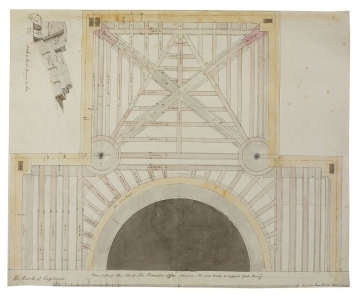 It is a more finished version of drawing 20, showing cross-wall vaulting, arch-ribs and iron tie-rods, as executed.